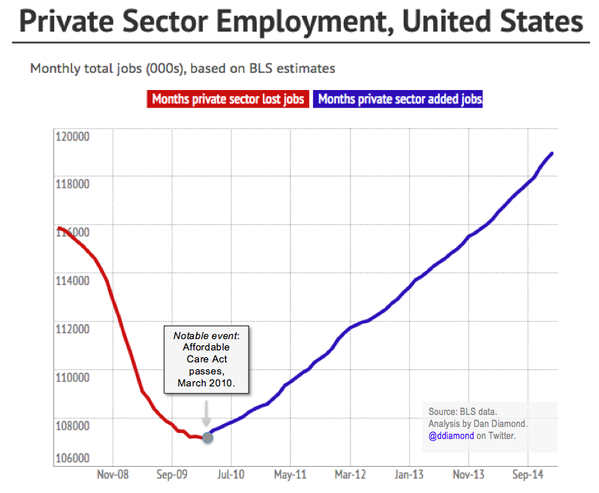 When facing simplistic charts like the one below your brain should scream “confounding!” In other words: there are too many ignored variables here to infer that Obamacare had any influence in the job market. It may well be that it had a negative impact, but that this impact was counterbalanced by other positive factors that the designer/journalist/activist decided not to show. We don't really know. 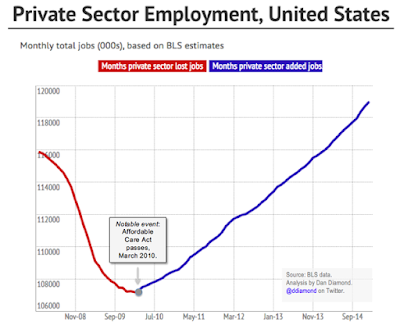 The chart is devoid of sorely needed context. It proves nothing. Just to remember a maxim inspired by Nigel Holmes: visualizations and infographics must never simplify; they must clarify. And, in order to clarify, sometimes you'll need to increase the amount of information included, not reduce it.